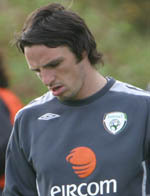 Jonathan Douglas (born November 22, 1981 in Monaghan, Ireland) is an Irish football player who currently plays for Leeds United. 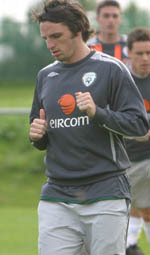 Douglas made his debut in the Football League of Ireland for Monaghan United aged 16. He first joined Blackburn Rovers after having been a trialist at Celtic and made his debut against West Ham in the Worthington Cup on October 31, 2000. A cruciate ligament injury in 2001 hampered his progress, and he was out for many months, managing to make it back in early 2002. In March 2003, he was loaned to Chesterfield for six weeks, in which time he played seven matches, and to Blackpool for three months, where he made a significant impact, playing in 16 league games and scoring three goals. However, with Blackburn struggling in the league, Douglas found himself returning to action on a regular basis, and shone for the team. His first Blackburn goal came at a very useful time, in a 4-3 victory over Fulham. On August 19, 2005, he joined Leeds United on a season-long loan. He impressed in the early half of the season, making over 40 appearances for the club and scoring five goals in the process. These performances impressed former manager Kevin Blackwell enough to make the move permanent, and on August 31, 2006, Douglas moved to Leeds permanently for an undisclosed fee, signing a three-year deal with the club. Douglas' performances impressed new manager Dennis Wise and kept him in the Leeds starting lineup. Douglas' only goal for the club that season came in the 2-1 victory against Coventry City. After Leeds' captain, Kevin Nicholls requested a transfer to Luton Town, Douglas was made captain by Wise. He had played numerous matches as Leeds captain previously due to injuries to Nicholls, Derry and Kelly. Douglas was forced to sit out the rest of the season when he received his 15th yellow card in the defeat at Colchester United. Leeds' relegation that season saw many Leeds fans believing that Douglas would leave the club; it was reported that Douglas had a training ground bust up with Wise . However, despite being stripped of the club captaincy, Douglas has been playing regularly in the Leeds first team in the 2007-08 season. Despite rumours of a transfer to Burnley, it is likely that Douglas shall be staying at Elland Road. Games in which Johnathan Douglas was a Substitute.